Guests help researchers by counting turtles and recording their observations on recreational dive. LITTLE CAYMAN ISLAND -- Guests of the Little Cayman Beach Resort, renowned for its outstanding wall diving, are also helping scientists by recording observations of sea turtles while on vacation. 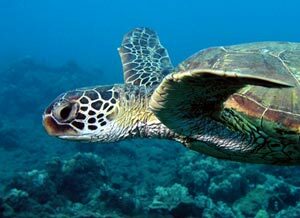 Three species of marine turtles actively nest in the Cayman Islands: the green, hawksbill and loggerhead turtles. Divemasters educate divers to distinguish among the endangered turtle species so they can record detailed information on dive slates underwater, which is gathered for REEF and the Cayman Islands Department of the Environment. From May to October, Resort staff and island residents who have been trained to assist with monitoring surveys, search for signs of marine turtle nesting. The nesting locations are then reported to the DOE Research Officer for data collection and further monitoring to protect the hatchlings. The goals of the Resort guests' research are to take advantage of keen observers already in the water and to educate guests to prevent further impact on turtles wherever they might dive in the future. "We tell divers, if they ever see a plastic bag in the water, while boating, diving or swimming, collect it immediately. Plastic can be deadly to sea turtles when they entangle themselves or it is mistaken for jellyfish and ingested - causing starvation by clogging their digestive system." said Sam Baker, Little Cayman Beach Resort manager. "We want our guests to go home with more than just great dive memories, we want their brains full of information like this that will hopefully be passed on to others." To assist Little Cayman Beach Resort in sea turtle preservation, weeklong dive excursions can be booked May to November by calling 1-800-327-3835 or visiting: www.littlecayman.com. Pre-dive briefings educate guests how to recognize males from females (males have longer tails) and to distinguish among the species in the area. 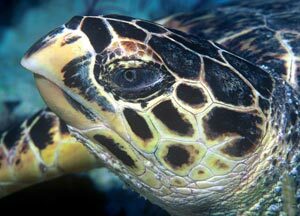 While green, hawksbill and loggerheads nest in the Cayman Islands, the green and hawksbill species are most commonly seen in the water by divers and snorkelers. These turtles, however, are not the same individuals nesting on shore. Highly migratory, these animals may have hatched on beaches hundreds or thousands of miles away. "Turtles spend different parts of their lifecycle in different areas of the region and even the world," said Joni Solomon, Cayman Island Depart of Environment (DOE) research officer. "The turtles that nest on Cayman's beaches are adult turtles that were born on those beaches, spend their lives in a different part of the region and only come back to Cayman waters every 2-3 years when they're ready to nest again. The smaller juvenile turtles that are frequently seen offshore are part of Cayman's foraging turtle population. These turtles will only spend this period of their lifecycle in these waters." Turtles with flipper tags are also reported to the DOE. When divemasters report the numbers on these tags, scientists can identify the individual turtle, where it was tagged and other documented sightings that form a connect-the-dots route of the turtle's journey. "We're privileged to see these prehistoric creatures under water, especially because we are the ones endangering their existence," said Sam Baker, Little Cayman Beach Resort manager. "Contributing to the research while educating our guests is our chance to address the issue and hopefully undo some of the damage." It's estimated there were 6.5 million sea turtles when Columbus sailed off course on his fourth voyage to the New World and arrived in the Cayman Islands in 1503. He said his men could walk from one ship to another on the backs of 'las tortugas,' the name originally given to the Cayman Islands. Many other hungry sailors followed, sparking the beginning of a long and devastating industry of turtle hunting for meat, shell and fat oil. Five hundred years later, there are about a dozen nests found on Little Cayman, and the World Conservation Union (IUCN) classifies all three nesting species -- green, hawksbill and loggerhead -- as 'endangered,' meaning there is a very high risk of extinction in the wild. Today, the most common threats to sea turtles are coastal development, poaching, pollution and artificial light, which can disorientate hatchlings heading to sea. With 57 marked and protected dive sites around Little Cayman Island, visitors have the opportunity to get up close and personal with over 500 types of fish and 100 different kinds of hard and soft corals. The 80∞ F (26.6∞C) water is second to none when it comes to clarity and the calm coastal reef areas make many water sports easily accessible. Bloody Bay Wall, a spectacular marine eco-system, is internationally known as one of the best wall diving locations in the world. Readers of Rodale's Scuba Diving Magazine voted the sister islands of Little Cayman & Cayman Brac the number one spot in the Caribbean for wall diving in the 2004 Reader's Choice Awards. A picturesque beachfront resort on a small island paradise just 10 miles long, Little Cayman Beach Resort is a family-owned retreat, known for its 'valet-style' diving. Guests put their dive bag outside their room on the first morning and from there it is valeted to the boat where staff maintain it all week. While not diving, there is a full-service spa, restaurant & bar, bicycles to explore the island as well as full island tours, including a visit to see the museum, indigenous iguanas and the Booby Pond Nature Reserve, an animal sanctuary and RAMSAR international wetlands conservation site. Do not touch, harass or grab onto sea turtles for a ride. If frightened, they can dive deeper to escape and run out of air before reaching the surface to breathe again. These are also criminal offences punishable by heavy fines. Do not buy turtle shell products. Recycle plastic, remove trash from the beach and secure trash on boats. Plastic can float thousands of miles in currents and kills turtles and other marine life. Encourage coastal properties in turtle nesting areas to reduce beachfront lighting to reduce hatchling disorientation. Write letters to government officials and conservation organizations in support of international agreements and laws protecting sea turtles from destructive fishing practices. Do not drive on beaches. Do not disturb nesting turtles if you come across them on the beach. Keep lights off the beach by drawing curtains and not using flashlights on the beach at night.